Posted 22 September 2010 under Ask Us. Diabetes is a chronic (long-term) illness that can happen when your body does not make enough insulin, or when your body has difficulty using the insulin that it does make. Whenever you eat food, your body digests it (breaks it down) into smaller parts: vitamins, minerals, protein, sugar (called “glucose”), and fat. Your body then uses these nutrients for energy. Glucose is the body’s major source of energy. Insulin is the hormone that helps your body change the glucose from your food into energy your body can use. If your body does not make enough insulin or if your body has difficulty using the insulin that it makes, the glucose from your food does not get changed into energy. Instead, the glucose stays in your blood, causing your blood glucose (also called “blood sugar”) to rise. 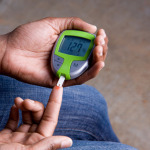 High blood glucose levels can cause serious problems to your body now and in the future.